As Craig Morgan Teicher said, "This is not Allen Ginsberg's Howl." 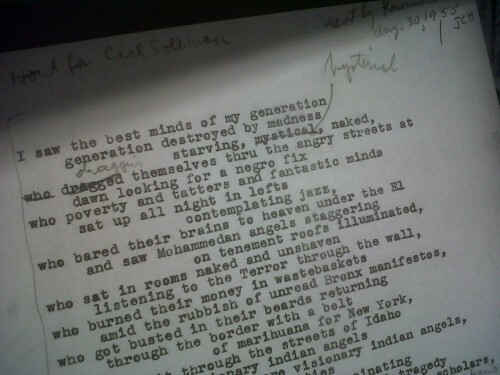 Even in this early draft of the poem, you can see Ginsberg's use of the form, the strophe as Teicher reminds us. It's easy to understand that the developers and coders of the world might not understand the requirements and the necessity of form when it comes to something so seemingly esoteric as poetry (although, I'm sure there are many many poetry loving coders out there). But, I agree with Teicher: where was the HarperCollins editor during all this? J'accuse! People are asking if poetry will survive the eReader. Of course it will. It is a genre, a mode of thought, a way of seeing the world. And eReaders are just a medium, a tool. If we must, we will let the poets go back to carving their words into stone. I don't foresee any re-formatting issues there. I think this is an oversight that will soon be corrected. It's still very new technology. Because of my eye site, I use one of the larger font sizes which is why I got my Kindle in the first place. When I first got my kindle, there were numerous awkward line breaks. I didn't notice any in my recent readings.